Gun Owners of America has weighed in on the nomination of Andrew Traver to head the Bureau of Alcohol, Tobacco, Firearms, and Explosives. I am a bit surprised that they waited so long to issue a statement given that the NRA and the Citizens Committee for the Right to Keep and Bear Arms issued strong statements within a few days of the nomination. It was not a good sign that Barack Obama kept his nominee to head the Bureau of Alcohol, Tobacco, Firearms and Explosives a secret until after the midterm election –- and then quickly announced that anti-gun zealot Andrew F. Traver would be named to fill the slot. After being blasted before November 2's election by the liberal New York Times for failing to beef up the ATF by appointing a director –- for fear of the wrath of the "gun lobby" -– Obama gets right past the election and, presto chango, a nominee appears. How 'bout that? And not just any nominee. As special agent in charge of Chicago's ATF field division, Traver had taken the lead in calling for a ban on semiautomatic firearms. * allow federal health and safety oversight of the firearms industry (through agencies such as the Centers for Disease Control, the Consumer Product Safety Commission and the Food and Drug Administration). It is disconcerting that ANY organization espousing these views would be taken seriously. That an activist in such an organization would be put in charge of the ATF is truly troubling. On their website, they have a pre-written letter that you can use to request your state's Senators oppose the Traver nomination. It can be sent as an email directly from their site. While good in signaling raw numbers opposed to the nomination, I don't think that is the most effective means of getting the message across. A personal letter hand delivered to the local office would have much more impact in my opinion. I think if you include with that letter a folder containing the statements of the NRA, CCRKBA, and GOA along with other information on Traver to bolster your argument it would add to the impact. In the pre-9/11 and pre-anthrax days, a handwritten letter sent to the Senator's office would have sufficed. With all the mail, email, and faxes that they receive daily, I think even that gets lost in the shuffle. It is much harder to ignore a person standing in front of your staff than it is one letter or email out of thousands received in a day. £277,250. 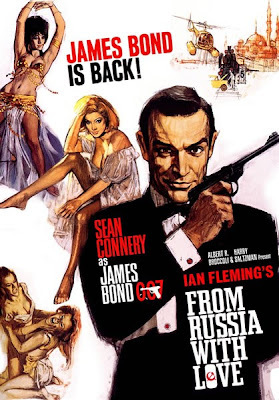 It was used in the poster for the 1963 Bond movie From Russia With Love. And as seen in the poster. The pre-auction estimate by Christie's was in the £15,000-20,000 range. I realize that it is associated with a James Bond movie but that is a lot of money to pay for a fancy BB gun! The San Diego Union-Tribune posted a story yesterday on the challenge to the requirement to show "good cause" to obtain a CCW in San Diego County, California. This is one of the first times that a major California newspaper has recognized the battle to have self-defense recognized as a "good cause". 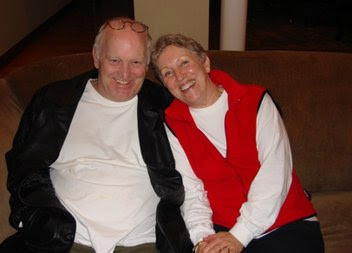 Ed Peruta and his wife Lois. What constitutes “good cause” is at the heart of the debate and the one element that is considered on a case-by-case basis. Peruta, by the way, has CCW permits in Florida, Connecticut, and Utah. He lives in his RV and is an independent journalist and resides part of the year in San Diego County. The rest of the litigants include a retired MD who's had death threats in the past, a retired Navy officer, a psych RN who has been threatened by patients, a young hair salon owner who makes large cash deposits late at night, and the California Rifle and Pistol Association. This thread started by Ed Peruta on the CalGuns Forum notes that some of the facts in the article are off a bit. Nonetheless, they are happy to see the issue getting coverage in a major paper. The best thing about the article, in my opinion, is the picture above of Ed and Lois Peruta. It shows that people wanting a CCW to protect themselves are just ordinary, everyday people. If you have been around the gun community for more than say 10 minutes, you know who Michael Bane is. He has a whole host of shows on the Outdoor Channel, puts out one of the best weekly gun podcasts around, is a fellow gun blogger, and an all around raconteur of the gun culture. The Outdoor Channel "for whom he labors" as Michael would say, is having their 11th annual Golden Moose Awards which are fan based. His shows like Shooting Gallery and the Best Defense: Survival are not eligible for these awards as he is an employee of the Outdoor Channel. However, Michael is eligible to win the award in the Fan Favorite - Host/Personality category. If he wins, he promises to throw a big party for everyone in the gun culture! With plenty of free ammo for everyone! Just kidding, Michael. And thanks for the encouragement you gave me at the NRA Annual Meeting in Charlotte to start this blog as I approach my 400th post. UPDATE: Tam and SayUncle both have reminder posts to go vote. Tam makes a great point about Best New Show and she will be doing some future work for S.W.A.T. Magazine. Paladin Press is having a one-day sale on certain books. Included in the sale is The World's Assault Rifles by Gary Paul Johnston and Thomas B. Nelson. This is the definitive book on the assault rifle and weighs, I am told, nine pounds. The list retail on this book is $69.95 and Amazon lists it for $56.20. Paladin Press is selling it today only (must purchase before 11:59pm MST) for $41.97 plus $4 shipping. You don't need any code. Go here for the book. They are also including for free a copy of Handbook of Handguns by Timothy Mullin when you purchase The World's Assault Weapons. 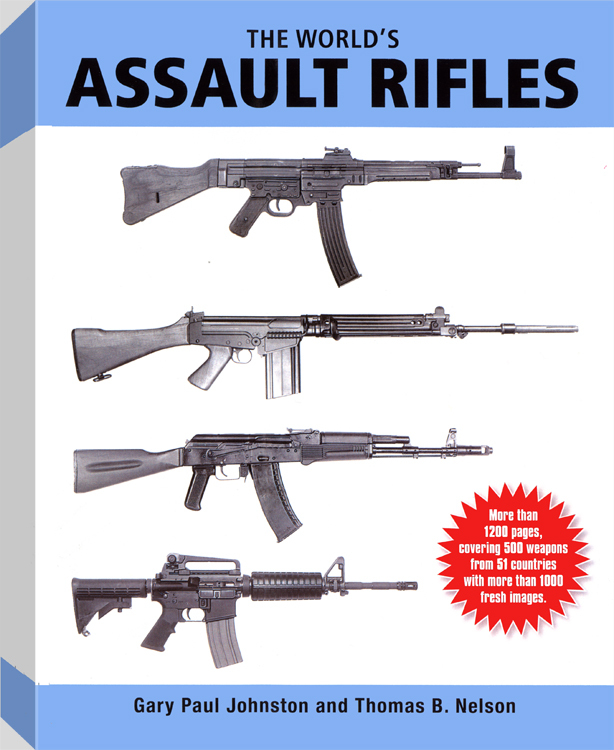 Defense Review called it the best and most complete book on assault rifles ever. I have no stake in Paladin Press or the book publisher. It is just a great deal. I had been thinking of getting this book for a while and this pushed me over the top. In the United States if you want to own a sound suppressor (or silencer) for your .22 rifle or pistol, you must fill out an ATF Form 4, pay a $200 tax, submit both a picture and fingerprints, get the signature of the chief law enforcement official in the jurisdiction of your place of residence, undergo a background investigation, and then wait. This is in addition to the cost of the suppressor which, I understand, begins in the $200 range. In New Zealand, you drive on down to Gun City in Christchurch, pay NZ$39.99 or about $29.91 in U.S. dollars, and walk out with your suppressor. As their ad says, "There are no age or licence restrictions on silencer sales." Of course, for the price you aren't getting the top of the line suppressor. However, if you want a suppressor for plinking on your .22 rifle or pistol, it will work just fine. And your hearing is protected. It is utterly ridiculous that at a time when so-called environmental groups are suing the EPA over lead ammunition to "protect hunters" from airborne lead exposure among other things that a reasonable method of reducing "noise pollution" and protecting the hearing of shooters still requires a $200 tax stamp. Military.com ran a story on Friday discussing the XM806 .50 caliber machine gun. The new machine gun is intended to be a lighter weight alternative to the venerable Browning M-2 Heavy Machine Gun. According to the article, this new developmental machine gun comes in at about half the weight of the M-2. Where the M-2 weighs approximately 120 pounds, the XM806 weighs just over 60 pounds. 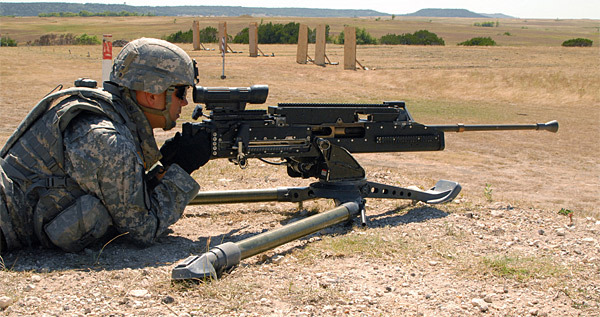 The new machine gun was developed by General Dynamics. It is currently being tested at the Aberdeen Test Grounds. Each of the four test guns has had at leat 90,000 round fired through it. The XM806 is not expected to be deployed to units until late 2012 if all goes well. The article makes clear that the M-2 is not being retired. Rather the XM806 is an effort to bring that same long range firepower to light infantry and special operations units. If you listen to these videos, it is clear that instead of blaming the person committing the crime, the organizers of Connecticut Against Gun Violence and My Brother's Keeper prefer to blame the gun. After all, it is easier to blame an inanimate object for the problem rather than a living, breathing, (supposedly) thinking human being. The videos in the New Haven Register are not able to be embedded. Instead go here and you can also read the unquestioning story that goes along with it. One thing the story points out is that Connecticut has some of the most restrictive gun control laws in the United States. If ultra-strict laws aren't working, what sort of illogic propels CAGV and My Brother's Keeper to keep asking for even more laws? Blogging may be light for the following week as I have jury duty. While I have been called a couple of times in the past, I always got a deferral. This will be my first time actually being part of the jury pool. Rather than ask for another deferral, I thought I should just go ahead and do it. I wonder if I get a case involving a shooting whether I'll be dismissed from the jury for having a gun blog. Hmmm. UDPATE: I've been given a one-day reprieve on jury duty. "This is an unprecedented attempt to arm teenagers ... even though most states currently restrict them from carrying a concealed weapon," said Daniel Vice , senior attorney for the Brady Center to Prevent Gun Violence . "Teen gang members could buy guns if this law is changed." James D'Cruz is 18 years old. By the logic of the Brady Center, the combination of the two makes James D'Cruz a potential "teen gang member". Nice racial stereotype, isn't it. I guess this is no surprise given their recent attack on Mr. D'Cruz where they took Facebook postings out of context to conclude he is fascinated with "with gangsters and outlaws, often quoting them, and include violent, threatening messages." By this logic, one would say the Yale Law Class of 1973 was filled with a bunch of hack politicians that slept with staff, attacks 18 year olds, and only got a job due to family connections. It makes as much sense. The lead editorial in Friday's New York Times was entitled Handguns for 18-Year-Olds? As one has come to expect from the Times, the editorial was full of the trite phrases and misleading statistics used by gun banners along with their own sense of righteous indignation. Undermine public safety. Scuttle basic gun controls. Common-sense efforts. The deadly loophole. The gun lobby. Gun traffickers. Allow armed teenagers. Unlicensed sellers. Powerful semiautomatic weapons. Reasonable restrictions. The Times' editorial may have left out one or two phrases from the approved lexicon of the Brady Campaign but that's all. The editorial starts with the accusation that the NRA "keeps coming up with clever new ways to undermine public safety." It then launches into a litany of supposed sins committed by the NRA including opposition to the Lautenberg proposal to ban firearm sales to anyone on the FBI's "terrorist watch list" and to a requirement for NICS checks on private sales of firearms between individuals. The Times gets in a plug for Andrew Traver, Obama's nominee to head ATF, calling him a "well-qualified career professional". They bemoan opposition to him by "the gun lobby" saying his "sin" was merely to associate with "a police chief's group that wants to reduce the use of handguns on city streets." 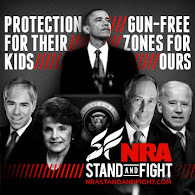 That it was funded by the virulently anti-gun Joyce Foundation is immaterial to them. The meat of the editorial is an attack on the NRA for bringing the D'Cruz cases challenging the ban on the sale of handguns to legal adults under the age of 21 and challenging the Texas CHP law which sets 21 as the minimum age for non-military, non-veteran adults. As a legal matter, both lawsuits should fail. In its recent Second Amendment rulings, the Supreme Court struck down complete bans on handgun ownership, but explicitly left room for limits on gun ownership and possession by felons and the mentally ill, and other reasonable restrictions like Texas’ age limitations. The Supreme Court has said nothing to suggest that the Second Amendment requires Americans to allow armed teenagers in their communities. Beyond the dubious legal claims, the idea that young individuals ages 18 to 20 have a constitutional right to buy weapons and carry them loaded and concealed in public is breathtakingly irresponsible. They then throw out statistics saying that 18-20 year-olds commit more violent crime than other age groups and imply that lowering the age to 18 will just put more weapons in the hands of this group. Of course, this ignores both the NICS check required for a purchase of any firearm from a licensed dealer and the training, background, and other requirements needed to obtain a Texas Concealed Handgun License. As an aside, private sales of handguns are permitted for 18-20 year olds in the State of Texas and 18-20 year olds can and do obtain Texas CHL's if they serve or have served in the military. This, too, is ignored by the Times in their editorial. The Brady Campaign jumped the gun with their amicus brief in D'Cruz v. McCraw and had to withdraw it. However, as this editorial illustrates, Big Media is more than willing to continue to be a shill and do the propaganda work for them. Some things just never change. Thirdpower at Days of Our Trailers blog has the results of expansion testing with Hornady Critical Defense ammunition. His uncle tested .45 Colt LEVERevolution, .45 ACP, .40 S&W, .38 Special, and 9mm by shooting them into water jugs and then recovering the slugs. They look like they had uniform expansion as well as good weight retention when compared to the unfired cartridge. This is the ammo I carry in my Ruger LCR in 110 grain .38 Special +P. I like it even more now that I've seen the results of this test. Is There Anything A Laser Can't Improve? If you need help finding the parts, go here. Here are all the Black Friday (or earlier) sales that I've been able to find. I have included any coupon codes if needed. If you find others, please share them in the comments section. Every day, Wednesday, November 24 through Monday, November 29, MidwayUSA will be offering special deals for Customers to celebrate the traditional Black Friday and Cyber Monday shopping days. On non-sale items, $15 off any $100 order. Today Wolf .223 is $244 a case among other things. Academy has Taurus 9mm 609 Compact for $289.99 and Winchester White Box 9mm for $10.99. If you like them on Facebook, they will give you early notice of what the codes and sale items will be. Among other things, Remington ammo is buy one, get one 50% off. Has listings for both in-store and online specials. Sale goes through Tuesday. Free shipping on all orders over $99 with code GIFTS. Thanksgiving Day and online only, save 20% with code DUNTHANKS2010. Executive Holster on sale for $75 until Tuesday, Nov. 30th. Saiga shotguns and accessories. 20-round drums are marked down to $80. Great for the Zombie Apocalypse! Kershaw Ken Onion Leek Assisted Opening knife for $29.95. Free shipping on many items and free shipping on all orders over $149 with code SHIPFREEPROMO. Black Rifle Sale goes from Friday November 26 00:00 PST and ends Saturday November 27 23:59 PST, 2010. Use code BRF2010 at checkout. Discounts vary by product. 10% off knives from Gerber, ESEE (Rat Cutlery), Spyderco, Kershaw, Microtech, and Benchmade. Get three accessory items - wide admin pouch, a M4 double shingle, and a surgical glove pouch - with any order of regular items that total $150. Use code 3THANKS. 15% off everything except 5.11 Tactical products. Use code PN10J152. Good through Monday, Nov. 29th. Free shipping on all products. ProTool features the Woodsman's Pal and hunting books by J. Wayne Fears. Cosmetic seconds on the Woodman's Pal are $39.95 instead of $67.95. 10% off with code GIVE10. Excludes non-5.11 closeouts. As I wrote about here, the Brady Center recently had to withdraw an amicus brief in the Texas case challenging the prohibition on concealed carry by non-military, non-veteran 18-20 year olds. The lead plaintiff in the case is James D'Cruz of Lubbock, Texas who participated in his school's NJROTC shooting program with great success and who had passed all the requirements to be granted a Texas Concealed Handgun Permit except for his age. The Brady Center decided since they couldn't file their amicus brief they should do everything in their power to denigrate Mr. D'Cruz. They issued a press release yesterday featuring excerpts from his Facebook page and, more or less, accused him of being a violent and twisted individual. Of course, they took stuff out of context which is about par for them. Sebastian at SnowFlakesInHell does a great job in parsing their press release. The Brady Center is about as effective and relevant as TSA which doesn't say much for either organization. They also share the small-minded trait of getting nasty after having been called out on their goofs. The Brady Center certainly doesn't provide a very good example of how adults should behave. Professor Eugene Volokh of the Volokh Conspiracy blog has a very interesting post today on a case from Pennsylvania. The case, Huet v. United States, involves Melissa Huet who was indicted on aiding and abetting a felon in possession of a firearm. She lived with Marvin Hall, described in quaint terms by the court as her paramour, and she owned a Yugoslavian SKS M59/66. Ms. Huet had no criminal record, no mental health disabilities, and was otherwise legal to own a firearm. The government accused her of aiding and abetting a felon to be in constructive possession of a firearm. The court disagreed and found that she was protected under the Second Amendment. Read all of Professor Volokh's excellent analysis of the case here. He also has the link to the court's opinion. WASHINGTON— Conservation and hunting groups today sued the Environmental Protection Agency for failing to regulate toxic lead that frequently poisons and kills eagles, swans, cranes, loons, endangered California condors and other wildlife throughout the country. The EPA recently denied a formal petition to ban lead in fishing tackle and hunting ammunition despite long-established science on the dangers of lead poisoning in the wild, which kills millions of birds each year and also endangers public health. In August, a coalition of groups formally petitioned the EPA to ban lead in bullets and shot for hunting and in fishing tackle under the Toxic Substances Control Act. The petition referenced nearly 500 peer-reviewed scientific papers illustrating the widespread dangers of lead poisoning to scavengers that eat lead ammunition fragments in carcasses, and to waterfowl that ingest spent lead shot or lost lead fishing sinkers. The groups filing the lawsuit today are the Center for Biological Diversity, Public Employees for Environmental Responsibility and Project Gutpile, a hunters’ organization. Since the original petition was filed, more than 70 organizations in 27 states have voiced support for the lead ban, including those representing veterinarians, birders, hunters, zoologists, scientists, American Indian groups, physicians and public employees. The EPA denied the portion of the petition dealing with regulation of lead ammunition based on an incorrect claim that the agency lacks the authority to regulate toxic lead in ammunition. The EPA asserted that shells and cartridges are excluded from the definition of “chemical substances” in the Act. That claim is contradicted by the legislative history of the Toxic Substances Control Act, which provides clear and specific authority to regulate hazardous chemical components of ammunition such as lead. Earlier this month the EPA also issued a final determination denying the portion of the petition on fishing sinkers, even though the agency itself had proposed banning certain lead fishing weights in 1994. Hunters and anglers in states that have restricted or banned lead shotgun ammunition or lead fishing gear have already made successful transitions to nontoxic alternatives, and fishing and hunting in those areas remains active. Alternatives continue to be developed, including the U.S. military’s transition toward bullets made of non-lead materials. For more information, read about the Center’s Get the Lead Out campaign. Read Frequently Asked Questions about the lead ban petition. View photo images and video of wildlife poisoned by lead ammunition and sinkers. The Center for Biological Diversity (www.biologicaldiversity.org) is a national, nonprofit conservation organization with more than 315,000 members and online activists dedicated to the protection of endangered species and wild places. Project Gutpile is an educational organization comprised of hunters that provides resources for lead-free hunters and anglers. Project Gutpile has been promoting non-lead ammunition and raising lead awareness in the hunting community since 2002. Public Employees for Environmental Responsibility (PEER) is a 10,000 member national alliance of local, state and federal resource professionals working to protect the environment. PEER members include government scientists, land managers, environmental law enforcement agents, field specialists, and other resource professionals committed to responsible management of America’s public resources. What the hell kind of name for a responsible hunting group is Project Gutpile? It sounds like the Brady Campaign's friend American Shooters and Hunters Association which had no more to do with gun rights than the man in the moon. The lawsuit that they say they have filed can't be found on the U.S. Courts's electronic file system as of yet. When it is up, I will post a copy of the complaint. NEWTOWN, Conn.—In response to a lawsuit filed today challenging the Environmental Protection Agency's denial of a petition to ban traditional ammunition containing lead core components, the National Shooting Sports Foundation will file a motion to intervene. This action allows NSSF to protect industry's interests in the case and ensure that the will of Congress is adhered to. The suit was brought by the Center for Biological Diversity, which earlier this year had petitioned EPA to ban traditional ammunition as well as fishing tackle containing lead. CBD claims wild birds are being harmed through the ingestion of spent ammunition fragments, though NSSF contends that no scientific evidence shows that wildlife populations are being affected. In August after considering the CBD's petition, EPA denied the request, saying it did not have the legal authority to regulate the production and distribution of traditional ammunition under the Toxic Substance Control Act of 1976. Congress expressly exempted ammunition from being regulated by this law. Some weeks after the agency's decision on traditional ammunition, EPA also denied the other half of CBD's request to ban fishing tackle. This one-two punch no doubt prompted CBD to file its lawsuit. "We knew that this fight was far from over even after we gained that early victory," said Lawrence G. Keane, NSSF senior vice president and general counsel. "The CBD petition and now this lawsuit are clearly attacks on the right of hunters to choose the ammunition that best suits their hunting and target shooting needs, and they are attacks on hunting as well." Launching a strong grassroots campaign in response to the CBD petition, NSSF mobilized the sporting and gun-owning community to make its support for traditional ammunition clear to the EPA and its administrator, Lisa P. Jackson, via e-mailed comments and by contacting their lawmakers. Wildlife management is the proper jurisdiction of the U.S. Fish and Wildlife Service and the 50 state wildlife agencies. Lawyers for the NRA and CRPA Foundation have submitted another set of comments to the California Department of Justice ("DOJ") opposing DOJ’s recently revised proposed regulations requiring new handgun models sold in California to be equipped with a "microstamping" mechanism. If adopted, the new regulations may be used to implement AB 1471, which requires that after January 1, 2010, all semiautomatic pistols not already listed on the roster of handguns approved for sale by firearm retailers be "designed and equipped" with microstamping technology. The law only takes effect "provided that the Department of Justice certifies that the technology used to create the imprint is available to more than one manufacturer unencumbered by any patent restrictions." The current technology is not only unreliable, it is also encumbered by a patent. For those reasons, AB 1471 has yet to be implemented. Microstamping is a theoretical process whereby a semiautomatic firearm leaves a unique imprint on each ammunition casing ejected from the firearm upon discharging it. Given the lack of available micro-stamping technology, these proposed regulations are completely unnecessary. The NRA & CRPAF are objecting to the DOJ even engaging in the rulemaking process at this time for this reason and others. The NRA & CRPA letter to the DOJ is posted here. The NRA and CRPA submitted a similar letter to the DOJ on February 15, 2010 during the initial comment period, but the DOJ has nonetheless insisted on proceeding with the rulemaking process. The most recent letter to the California DOJ can be found here. The earlier letter may be found here. The lefty website, TPMMuckraker posted a story ridiculing the NRA's opposition to Andrew Traver as head of ATF. They titled the story NRA Opposes Obama's ATF Nominee Because They Googled Him. According to his interview with the NRA-sponsored radio program, Cox's opposition to Traver is based on Internet searches from when Traver's name was first floated over the summer. "I sat at my computer when this guy's name was first brought up and Googled him," Cox said, encouraging listeners to do so themselves. "That's just guilt by association to the first degree," Paul Helmke of the Brady Campaign to Prevent Gun Violence told TPM. "If you sit down in a room with the chiefs of police that the Joyce Foundation put on, you're automatically suspect. They didn't even go to the content of what was in any of these recommendations." Well, heck, I did the same thing - only sooner. Back in July I started doing Google searches for Andrew Traver and found what was available on him. And actually, it was quite a bit. I found out what fellow ATF agents thought of him, I found out how he cozied up to politicians, I found out that he made a habit of working with anti-gun organizations such as the Joyce Foundation and the IACP, I found out that he was a cancer survivor, I found pictures of his wife and sons (which I didn't post), I found news clips of him at press conferences with then-Representative Mark Kirk who is anti-gun, and I could go on. I'm not an "accredited or authorized" journalist so I could not just call Andy or the White House up to ask about the status of his pending nomination and expect to get an answer. Google and the Internet were the only ways to gather the info I sought. That said, there are questions to which I would like answers. For example, I'd like to see Andrew Traver's full military record including his fitness reports. He represents that he was ranked third in his Officer Candidate School class and was a honor graduate of the Surface Warfare Officer School. The normal officer service commitment upon commissioning is three to five years. Yet Traver seems to have served a shorter time period than this. If he was 44 years old in 2008 when diagnosed with prostate cancer and joined the ATF in 1987, this would mean he was approximately 23 years old when he left the U.S. Navy to join ATF. Assuming he was 21 when he graduated Northern Illinois University, that would give him two or maybe the minimum three years of service. Moreover, why would he give up what seemed to be a promising Navy career to join a backwater Treasury Department agency. The 1980s were the Reagan years and the Navy was expanding towards a 600 ship Navy. They needed officers as well as men to run those ships. The ATF didn't have (and still doesn't have) the law enforcement reputation that you'd find in the FBI or the Secret Service. If Traver ever does get to confirmation hearings and isn't made a recess appointment, I hope some Senator or their staffer asks those questions. Plus a whole lot more. Bet She Could Get A Job With TSA! An Idaho woman posing as a plastic surgeon duped at least two women into letting her "examine" their breasts in a Boise bar and nightclub. Kristina Ross, 37, remains in Ada County Jail in Boise on two felony counts of practicing medicine without a license. Police say Ross introduced herself to victims -- one at a downtown Boise bar and the other at a nightclub in a Boise suburb -- as a plastic surgeon named Berlyn Aussieahshowna, a name that turned out to be bogus. The two women told Boise officers they believed Ross was a physician because of her apparent medical knowledge, and they agreed to undergo what they thought were breast exams, which happened at the bars. Dr. Berlyn Aussieahshowna ? Who in their right mind would go to a surgeon named Aussieahshowna? Heck, I can't even begin to pronounce it. Even more astounding is that they let her examine their breasts in a bar. It sounds like something out of the movie Animal House with Eric Stratton aka Otter doing the examining. In the challenge to the Illinois FOID card brought by the Mountain States Legal Foundation, Mishaga v. Monken, Chief U.S. District Court Judge Michael P. McCuskey denied the defense's motion to dismiss the case. His seven-page opinion was released this afternoon and orders the Illinois State Police to file an answer to the complaint by December 17th. The Illinois Attorney General's Office had filed a Motion to Dismiss in this case on October 15th. The motion was brought under Federal Rules of Civil Procedure Rule 12(b)(6) for a failure to state a claim upon which relief could be granted. They contended that Ms. Mishaga did not need a FOID card as she met one of the 6 exceptions to the requirement for out of state residents. Thus, the State Police's denial of a FOID card for her was irrelevant and the case should be dismissed. Attorney Jim Manley of the Mountain States Legal Foundation responded with a memorandum in opposition to this motion to dismiss on October 26th. He pointed out that in the original complaint for Ms. Mishaga that she sought to be be able to possess a functional firearm. Five of the six exceptions to the FOID card of out of state residents required an unloaded and cased firearm if not actively participating in hunting or a shooting event. The sixth exception required Ms. Mishaga to be licensed or registered in her state of residence. The only problem with that is that the state of Ohio does not register or license firearms owners and actually forbids it. He said the defense had confused lawful possession with licensing or registration and that was not was the Illinois law said. Judge McCuskey's opinion took a very methodical approach to determining whether the plaintiff stated a claim that could be granted relief. He first restated the facts of the case and makes note that she wishes to possess a function firearm while residing in her friend's home. He then examined the case law regarding when it was proper to dismiss a complaint for failure to state a claim upon which relief can be granted. Judge McCuskey first looks at whether the complaint sufficiently spelled out the facts of the case. The Federal Rules and case law require that the allegation be "simple, concise, and direct" and that it contain enough factual content so that the court can "draw the reasonable inference that the defendant is liable for the misconduct alleged." He found that under this standard a claim had been made. He then examined whether the Illinois FOID card requirements infringed upon her right to possess a functional firearm. He notes that Heller found the Second Amendment protected the right to possess a firearm in one's own house for self-defense and that Illinois generally requires a FOID card. The State Police have interpreted the law to require an Illinois driver's license and this has interfered with her right to have a weapon in her temporary residence. By asking for declaratory and injunctive relief to stop the Illinois State Police from interfering with her right to possess a firearm, he says she states a claim. In this case, Mishaga is a guest in someone else’s home. The parties do not address whether Mishaga’s right to possess a weapon as a guest may be more limited than the homeowner in Heller because she is not protecting her own home and because her loaded weapon may present dangers to the permanent residents of the home or to other Illinois citizens. At some point in this proceeding, the parties may need to address the exact scope of the constitutional right of a guest to possess a weapon in the home of another person. Amendment guarantees Mishaga the right to possess a weapon at her residence that she may use for personal protection in case of a confrontation. Heller, 128 S.Ct. at 2797. Five of the six exceptions cited by the Director do not allow Mishaga to possess a weapon in useable condition in her friends’ home. The Heller Court held that a requirement to make a weapon inoperable,such as the requirement that the weapon be unloaded and enclosed in acase, violates the homeowner’s constitutional right to bear arms because therequirement makes the weapon useless for personal defense. Heller, 128S.Ct. at 2818.3 Even with these exceptions, therefore, the Act still prohibitsMishaga from possessing a useable weapon for defense in her friends’residence. For purposes of the Motion, the Court must assume that she does not, and so, must assume that this exception does not apply to her. The Complaint, therefore, alleges that the Act prohibits Mishaga from possessing a weapon at her temporary residence in Illinois that she may use for personal protection in violation of her constitutional right to bear arms. Mishaga states a claim. Given the recent electoral results in Illinois where the anti-gun rights candidate won the Governor's Office, the outcome of this case bears watching. As it is, the arguments of the Illinois Attorney General's Office have been found lacking and their motion to dismiss was denied. UPDATE: Eugene Volokh examines the case here on the Volokh Conspiracy and Dave Hardy comments on the case at Of Arms and the Law. Given that both of these attorneys are leading Second Amendment scholars, I see this as recognition that Mishaga is turning out to be more important than some previously thought. According to The Truth About Guns blog, this video of Andrew Traver and a reporter shooting an AK-47 which has been circulating on the Internet disappeared for a while. It is back up and worth watching again. If there were firearms experts on that range, then why was the reporter from NBC Chicago allowed to handle it in such an unsafe manner? Did they purposely have the reporter shoot from the hip in an effort to make a propaganda point? If a ten year old child soldier in some banana republic in Africa can effectively handle an AK-47, why can't the reporter? Am I supposed to believe that some warlord would provide better firearms training than the ATF? I'm sure this video played well on the Chicago Gold Coast but to anyone with any experience with firearms the conscious and deliberate display of unsafe gun handling in an attempt to score political points is an abomination. Ilya Shapiro, Senior Fellow in Constitutional Studies at the Cato Institute, and Editor-in-Chief of the Cato Supreme Court Review, has provided a very useful tool to any one who seeks a better understanding of how the Second Amendment and gun rights were incorporated to states and municipalities. In More Friends of the Second Amendment: A Walk through the Amicus Briefs in McDonald v. Chicago he has summarized each and every amicus brief that was submitted to the Supreme Court in the case of McDonald v. Chicago. Given that there were 32 briefs in favor of McDonald, 16 in favor of Chicago, and two that were ostensibly neutral, this was a major task. And so, in the wake of Heller, legal scholars and lay people alike widely anticipated the Court’s rejection of Chicago’s far-reaching prohibition on private gun ownership but did not know how the Court would go about doing so. Would it resurrect the Privileges or Immunities Clause or continue using a suspect doctrine—one that Justice Antonin Scalia has called “babble”—for protecting individual rights against state infringement? That was perhaps the most interesting question at issue in McDonald, but there were others too, with activists, think tanks, politicians, and concerned citizens of all stripes filing 50 amicus briefs (fourth all-time). Many focused on the Due Process versus Privileges or Immunities issue, while others discussed the incorporation of rights generally—treating the debate over Fourteenth Amendment clauses as an academic technicality. The breadth of the amicus briefs provide an insight into the divisions between those who are pro-gun rights and those who were anti-rights. You had state attorneys general on both sides of the issue just as you had competing groups of Members of Congress. Some briefs, more or less, duplicated the arguments of other amicus briefs and were probably submitted as much as to say they did something (and to raise money) as anything else. That said, Shapiro notes "a not insignificant number of the briefs—even if they didn’t end up being cited—seemed to have genuinely helped the justices write their opinions." This belongs in everyone's library of works on the Second Amendment. Think of it as serious Cliff Notes guide to the amicus briefs presented in McDonald. If you need to do more in-depth research on a brief, this compendium will point you in the right direction. BELLEVUE, WA - The Second Amendment Foundation today filed suit in U.S. District Court for the District of New Jersey against several New Jersey officials for deprivation of civil rights under color of law. SAF is joined in the lawsuit by the Association of New Jersey Rifle & Pistol Clubs, Inc. and six private citizens whose applications for permits to carry have been denied generally on the grounds that they have not shown a "justifiable need." One of the plaintiffs is a kidnap victim, another is a part-time sheriff's deputy, a third carries large amounts of cash in his private business and another is a civilian employee of the FBI in New Jersey who is fearful of attack from a radical Islamic fundamentalist group. Plaintiffs are represented by attorneys David D. Jensen and Robert P. Firriolo with the firm of Duane Morris, LLP in Newark. Named as defendants in the case are three Superior Court judges, Philip J. Maenza, Morris County; Rudolph A. Filko, Passaic County and Edward A. Jerejian of Bergen County, plus Col. Rick Fuentes, superintendent of the State Police, Hammonton Police Chief Frank Ingemi and New Jersey Attorney General Paula T. Dow. "Law-abiding New Jersey citizens have been arbitrarily deprived of their ability to defend themselves and their families for years under the state's horribly-crafted laws," said SAF Executive Vice President Alan M. Gottlieb. "The law grants uncontrolled discretion to police chiefs and other public officials to deny license applications even in cases where the applicant has shown a clear and present danger exists. "If being a kidnap victim, or part-time law enforcement officer, or the potential target of a known radical group does not clearly demonstrate a justifiable need," he continued, "the defendants need to explain what would. Do citizens need guns to their heads or knives to their throats before the state considers their need to be justified? "Supreme Court rulings have made it clear that the Second Amendment prohibits states from completely banning the carrying of handguns for self-defense," Gottlieb said. "Nor may states deny citizens the right to carry handguns in non-sensitive places or deprive them of the right to carry in an arbitrary and capricious manner. That's what is happening today in New Jersey, and we intend to stop it." Sebastian at SnowFlakesInHell has more on the suit here. A copy of the complaint may be found here. Normally the fact that a passenger stripped rather than to submit to being scanned or be patted down would be interesting but of not much relevance on a gun blog. Except when the person is well-known San Diego open carry activist Samuel Wolanyk. You may remember that at the end of September the City of San Diego reached a settlement with Mr. Wolanyk for his improper arrest for unloaded open carry. He won $35,000 and a Finding of Factual Innocence and the SDPD also agreed to enhance the training of their police officers. Through a statement released by his attorney Sunday night, Wolanyk said "TSA needs to see that I'm not carrying any weapons, explosives, or other prohibited substances, I refuse to have images of my naked body viewed by perfect strangers, and having been felt up for the first time by TSA the week prior (I travel frequently) I was not willing to be molested again." Wolanyk's attorney said that TSA requested his client put his clothes on so he could be patted down properly but his client refused to put his clothes back on. He never refused a pat down, according to his attorney. Wolanyk was arrested for refusing to complete the security process and for recording the incident on his iPhone, according to his attorney. My guess is that TSA is more upset about the recording of the incident on his iPhone than having Mr. Wolanyk strip down. The logic of TSA also baffles me. If you have a guy in his underwear in front of you, why do you need him to get dressed so you can pat him down? Can't you just look at him and see he doesn't have any weapons taped to his body? They could also examine the clothing on the floor if they thought something was secreted away in it. But then again, using the word logic in conjunction with TSA is an oxymoron. On Thursday, the ATF hand delivered a Cease and Desist order to KT Ordnance of Dillon, MT. They are a company that machines 60% unfinished 1911 frames and AR-15 lowers. The products requires additional machining to make them usable. 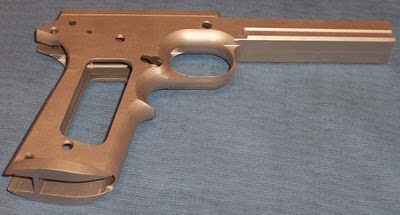 For example, on the 1911 unfinished frames, you still must cut the the slide rails and the barrel seat cut as well as drilling the hammer and sear holes. I know I'm not enough of a metal worker to do this! As you can see in the picture below, it is hunk of metal that can't readily be made into a firearm without much additional work. Here’s the thing: IF Celata is doing what the government accuses him of, since when do they give out warnings and advise people to get a license? Can you imagine the DEA finding you formulating and selling Oxycontin and responding by hand-delivering a letter telling you to stop and not resume activities until you become a legally-authorized pharmacist? And since when does ATF do things that way? This looks like nothing so much as a clumsy attempt at entrapment--if they can get him to acknowledge in writing that what he is doing constitutes manufacturing firearms, they'll be able to use that to obtain a warrant, do a raid and then characterize it to a jury as Celata's "admission/confession." Brownells, the source of parts and tools of darn near everything firearms related, is having their own Black Friday sale - except that it is a Black Rifle Friday sale. I think it is a great play on words! Here is their press release on it along with links to their coupon codes. Save on your gun related Christmas shopping starting at 12:00 AM, Friday, November 26! Go to http://www.brownells.com/.aspx/bapid=34/ClientPage/Black_Rifle_Fridayat 12:00 AM to get the special coupon code, or be a friend on Facebook http://www.facebook.com/BrownellsInc, and get early access to the coupon code, and a head start on savings. Entering the coupon code will save you 10% off any order over $150! The exclusive savings run through midnight, on "Cyber-Monday", November 29, so make out your wish list for Santa and get ready to save! And, selected items have special, reduced prices, available all weekend; AND, the 10% offer is good there, too! What can you say about the Iowahawk except that he is brilliant! Shame on those of you who have bought the "Don't Touch My Junk" T-shirts that entrepreneurs made available this week. Shame too on the Tea Party types who mocked the inviolable authority of the TSA by replacing the Gadsden Flag's "Don't Tread On Me" with Mr. Tyner's impertinent slogan. And treble shame on the blogger Iowahawk who demeaned not only the TSA but Frank Sinatra by recasting "Come Fly With Me" as "Comply With Me." (The lyric "Once I get you up there" became "Once I get all up there.") You should all be aware that the TSA is not amused. At the same time Colt's Manufacturing was rolling out the SP901 Modular Carbine to writers and bloggers at Gunsite, they were rolling out a new version of the 1911. Called the Rail Gun, it is part of their XSE line of 1911's and features an integral rail for use with weapon-mounted lights or lasers. 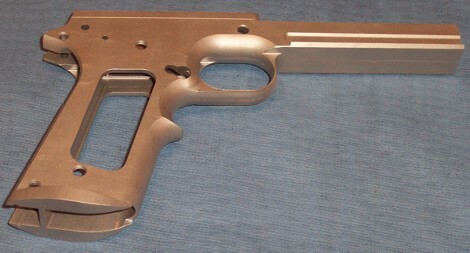 It is a full-sized Government model 1991 in either blackened or brushed stainless steel, has Novak 3-dot sights, an upswept beavertail grip, and the previously mentioned integral rail. Currently it is only available in .45 ACP. Michael Bane reviews the pistol for DownRange TV in the video below. From the comments he made, it is obvious that he likes it. I believe he said in his recent podcast that he liked it enough to buy it. When a gun writer buys a gun with his own money that says something. It is sometimes amazing what documents you can find that are still available on the Internet. I'm not talking about historical documents related to our country's founding that might be found in the National Archives. Rather I came across this old press release from someone that the State of Illinois would rather forget - then-Gov. Rod Blagojevich. CHICAGO – In a new effort to stop the flow of illegal guns into Illinois, Governor Rod Blagojevich today announced the creation of an elite gun trafficking police unit that will work with federal authorities and law enforcement agencies from two other states to detect and capture gunrunners and dealers. “Most guns used in crimes come from out of state. The more we can stop the flow of illegal guns into Illinois, the less gun crime and gun violence we’ll see. That’s why we’re creating an elite gun crimes unit to reduce the flow of crime guns into the hands of criminals. We’re going to track illegal guns to their sources and crack down on the sale and distribution of illegal guns,” Governor Blagojevich said. More crime guns flow into Illinois from Indiana and Mississippi than from any other state. According to recent data, 777 crime guns from Indiana and 532 crime guns from Mississippi were located in Illinois. Crime guns from these two states alone nearly equal the total number of crime guns from the next 10 states combined. Nationwide, close to 90 percent of guns used in crimes are trafficked. In Chicago, for the past two years more than 75 percent of murders involved guns. Trafficking is when a gun is passed from a legal buyer or seller, to a person or group who are not permitted to have a weapon. Trafficking also takes place when a gun is stolen, sold by a corrupt dealer to a criminal, sold to a legal buyer who gives it to a criminal, or inadvertently sold to a criminal. In Illinois, almost half of traced gun crimes were trafficked from another state. “Illinois is flooded with a deadly tide of crime guns that come from states that have very lax gun laws. This initiative will have a greater impact on reducing Illinois crime than any other gun safety measure currently being proposed,” said Jim Kessler, Policy and Research Director for Americans for Gun Safety. The gun-tracing unit will work with authorities in Indiana and Mississippi, coordinating information on purchases, allowing law enforcement to take action. The unit will also analyze federal data to detect trends and patterns and prevent criminal activity. The unit will be led by a Master Sergeant and will include five new intelligence analysts to study crime gun data and help lead agents to gun traffickers. The state troopers assigned to this unit will be trained by the federal bureau of Alcohol, Tobacco and Firearms (ATF). Illinois State Police Director Larry Trent, Mississippi Bureau of Narcotics Director George Phillips, Special Agent in Charge of the Chicago Division of the ATF Andrew L. Traver, and the leadership of the Illinois Association of Chiefs of Police as well as legislators and leaders from state and national gun control advocacy groups including Americans for Gun Safety, the Chicago Chapter of the National Brady Campaign and the Northern Suburban Chapter of the Million Mom March joined the Governor at the press conference. Blago, as he has become know in new headlines, was impeached and convicted by the Illinois General Assembly in 2009. He was later tried on Federal corruption charges. Blagojevich was convicted on one count of lying to the FBI when a mistrial was declared on the remaining 23 charges as the jury couldn't reach a decision. He will be retried on those charges in April 2011. It is important to remember that Blagojevich always made gun control a central part of his political campaigns. Running for reelection in 2006, he pummeled his Republican opponent mercilessly on gun control especially her opposition to a new assault weapons (sic) ban. I'm sure that is one news conference and one disgraced politician that Andrew Traver and those supporting his nomination to be the Director of the Bureau of Alcohol, Tobacco, Firearms, and Explosives would sooner forget. The beauty (and the curse) of the Internet is that things are never really forgotten. Congressman Bob "Who Are You" Etheridge has conceded defeat to Renee Ellmers. In the unofficial recount, Ellmers has maintained her approximately 1,500 vote lead. Ellmers, if you will recall, was rated AQ by the NRA and was eventually endorsed by them. Etheridge, by contrast, was rated D by the NRA. It is somewhat surprising that someone with his weak gun rights credentials could hold on to his seat in rural eastern North Carolina for so long. One last thing about Renee Ellmers - she has her CCW and didn't hide that fact. Traver is currently special agent in charge of Chicago’s BATFE field division, where he has a history of working with gun prohibitionists. He served as an advisor to the International Association for Chiefs of Police on that group’s 2007 “Gun Violence Reduction Project,” in cooperation with the anti-gun-rights Joyce Foundation. This project involved several high profile anti-gun-rights advocates, but there was not a single representative from the firearms community on the advisory panel. Traver helped develop the IACP/Joyce Foundation report, which recommended banning an array of modern sport-utility rifles and .50-caliber rifles used in long-range competition. The report also encouraged Congress to repeal the Tiahrt Amendment that protects sensitive trace data used by law enforcement in criminal investigations from being misued in frivolous municipal lawsuits that have consistently lost in court, and urged the adoption of restrictive gun show regulations that would effectively force them to close. Courtesy of the National Shooting Sports Foundation and Gunsite Academy comes this short video on the way to clear a malfunction in a semi-auto pistol. It is a good short training video. Like a scene from the first season of Saturday Night Live where Gilda Radner's character Miss Emily Litella is always saying "Never mind! ", so it is with the Brady Center. The Brady Center to Prevent Gun Violence today filed a brief in the United States District Court for the Northern District of Texas urging the court to throw out an NRA lawsuit claiming that teens and young persons ages 18-20 have a constitutional right to carry loaded, concealed weapons in public. “It is dangerous and reckless for the NRA to claim that teenagers should be allowed to carry loaded semiautomatic weapons on our streets and playgrounds. The Second Amendment allows for commonsense gun laws, it doesn’t require that we legally allow armed teens in our communities,” said Brady Center President Paul Helmke. The brief cites studies showing that young persons under 21 often lack the same ability as adults to “govern impulsivity, judgment, planning for the future, and foresight of consequences.” People aged 18-20 fall within the age range of offenders who commit the highest rates homicide and engage in criminal gun possession. According to the Brady Center brief, the U.S. Supreme Court has held that the Second Amendment protects a limited, narrow “right of law-abiding, responsible citizens to use arms in defense of hearth and home” but has also made clear that the right to bear arms “is not infringed by laws prohibiting the carrying of concealed weapons.” Laws restricting teenage gun possession and carrying are reasonable gun laws permissible under the Second Amendment. The Brady Center amicus brief was filed today in the case D’Cruz v. McCraw by attorneys with the Brady Center, the law firm Hogan Lovells and Texas attorney Scott Medlock. The Brady Center was joined on the brief by Texas organizations Mothers Against Teen Violence and the Texas Chapters of the Brady Campaign to Prevent Gun Violence. Today, in that same court, they filed a motion to withdraw their application of amici curiae. In light of the fact that defendants have not moved to dismiss Plaintiffs’ Amended Complaint and have instead requested additional time to respond to the Amended Complaint, the Brady Center to Prevent Gun Violence, Mothers Against Teen Violence, and Texas Chapters of the Brady Campaign to Prevent Gun Violence, through undersigned counsel, move to withdraw their application for leave to file a brief as amici curiae. This move was not opposed by either the NRA or the Texas Attorney General's Office. Perhaps to make up for their premature filing of their brief, the Brady Campaign then filed an application to file an amicus brief in the Westchester County (NY) pistol permit case, Kachalsky et al v. Cacace et al. They attached as an exhibit the proposed amicus brief. However, as I noted in a post describing the first endorsed letters in this case, Judge Cathy Seibel's Individual Practices 2.A. requires a pre-motion conference arranged by letter before a motion is allowed to be entered into the record. She makes no mention of amici curiae filings. One must wonder if the Brady Campaign is quite aware of just how tightly Judge Seibel runs her courtroom. If not, they well could be in for a surprise and may have to say "never mind" again. The Brady Campaign - the Miss Emily Litella of gun control groups. UPDATE: David Codrea has a post on an earlier oopsie that the Brady Campaign had with an amicus brief here. About a month ago, I did a post on Clark County, WI Judge Jon Counsell who ruled that that Wisconsin's ban on concealed carry was unconstitutional. At the time it was widely speculated that the State of Wisconsin would appeal that ruling. In an email that I received today from Asst. State Public Defender William Poss he said, "The good news is that the state did not appeal the ruling." That is good news indeed for residents of Clark County, Wisconsin! With the recent electoral victories of Republican Scott Walker as Governor and the Republican take-over of both houses of the Wisconsin State Assembly, look to see a bill authorizing concealed carry statewide in 2011. Daniel L. Shields III, of Pennsylvania, a Career Member of the Senior Foreign Service, Class of Counselor, to be Ambassador Extraordinary and Plenipotentiary of the United States of America to Brunei Darussalam. Joseph M. Torsella, of Pennsylvania, to be Representative of the United States of America to the United Nations for U.N. Management and Reform, with the rank of Ambassador. Joseph M. Torsella, of Pennsylvania, to be Alternate Representative of the United States of America to the Sessions of the General Assembly of the United Nations, during his tenure of service as Representative of the United States of America to the United Nations for U.N. Management and Reform. Marsha Ternus, of Iowa, to be a Member of the Board of Directors of the State Justice Institute for a term expiring September 17, 2012, vice Robert A. Miller, term expired, which was sent to the Senate on September 13, 2010. It's official now. Time to start writing both of your state's Senators even if they are anti-gun sorts. No letters, faxes, or emails let them say they didn't hear any opposition to Andrew Traver as the head of ATF. Chivers forced me to retract my statement during the lead in to the show that he was a “sort of gun expert.” He admits that he’s done a lot of reporting on guns, talked to a lot of fighters who use them and researched the history of firearms, but it’s not like Col. Doug Tamilio at PEO Soldier Weapons is ringing his phone off the hook with a job offer. If you’re into the caliber debate, want to relive the ill-fated rush to field the M-16, are a student of the civil war, World War II and the Cold War, like the M-14 better than the AK-47, like the AK-47 better than the M-14, are a student of the inner workings of Soviet economic planning and international revolutions or are intrigued by how something as simple as a rifle gets from paper to palm, The Gun has something in it for you. Christian at the Kitup Blog did a longer interview with Chivers. It runs about 30 minutes and can be found in the embedded player below. In my earlier posts on Andrew Traver, I referred to a website and forum run by dissident ATF agents upset with the mismanagement and corruption within BATFE called CleanUpATF.org. The comments from these agents who know or had worked with Traver was that he a nice guy but out of his league as a manager. That was then and this is now. It looks like even those who were his harshest critics within ATF are circling the wagons and supporting Traver. A new ATF Director has finally been nominated. As expected, the Chicago SAC has been given the nod and officially nominated to the position. The change in leadership is long overdue. We can only hope he will lead this agency into the future and not into the ground, like the last few folks. Also, we can hope that he cleans house in SOD, starting with the Chief and his little shadow, the newly promoted Deputy Chief. Maybe we can get back to the basics and support the everyday working agents out on the street. Please carry this agency into the future. Don't get your hopes up. This is all smoke and mirrors. DOJ and the White House have never really tried to find someone for director. Traver is all they half-heartedly put together. He will never pass confirmation. My bet is that he gets a hold put on his nomination within a week. I would encourage all of us to give Traver our support. He deserves the benefit of the doubt. He has a massive mess to clean up but lets hold out hope that he can do it. He deserves a chance to succeed. There is not much patience left out there so no doubt he does needs to go to work quick. I think we'll find out pretty quick if he is the real deal. If the White House put him in the Director's chair just to keep a seat warm and fend off the critics, we'll see that immediately. If he comes in and makes moves and decisions and improvements then he'll do everything that Melson couldn't or wouldn't and likely be embraced. I am a little amazed that they left Traver all this baggage that his predessors created but time will tell if he can man up and get things working again. I will say this, if he doesn't move quick then he'll be in trouble. The men and women of ATF need results now. If he drags his feet he is going to be viewed as another Truscott-Sullivan-Melson DOJ lap dog. Good luck Traver, bring us back please. Did he ever remove that ASAC who purchased the Cadillac? If his first decision is to appoint Martin DD, he's already lost. Probably trying to fly under the radar, the U. S. Attys office released (over the weekend) that the big NEUTRALITY ACT case Martin supported and solf the Director on, has been dismissed. They did not mention the ONLY thing seized in that huge caper, THE BLACK RHINO HORN. Yes it got Martin press and yes he wasted an entire squads resources and yes he seized NO GUNS. I guess the good news is that he allow us to blow $235000+ like he did on the OTHER big wire case. Great Job. I think we owe Traver a chance and not be quick to pre-judge. We all ponder what we would do different if we were to replace our boss. Traver is a well educated man and I have to believe that he has seen the decline of this agency over the last few years. Lets give him the benefit of the doubt that he is well intentioned, will seek good counsel, learn from past mistakes and focus on mission. It is about time we have a cop at the helm, the lawyers have proved inadequate and incapable of decision making. We have NO choice but to give him a chance. Its the right thing to do. BUT He only gets SO LONG to say, "I inherited these problems" before he too will be held accountable. This is OUR Bureau too. Work fast Mr. Traver. We want you to have success and be a great Director but you have to work fast. Stop the trainwreck and you will be the peoples champ. One of the first rules of any bureaucracy is that intense infighting is allowed and even encouraged. However, any attack from outside the organization must be resisted at all costs even if it is aimed at someone you despise. Big Media - Andrew Who? If one was to depend on the mainstream media or big media to know that Andrew Traver had been nominated by President Obama to be the Director of the Bureau of Alcohol, Tobacco, Firearms, and Explosives, you'd be out of luck. Only two of the 25 largest newspapers in the country have any mention of the Traver nomination. The New York Times had a report on Nov. 15th and originally spelled Traver as "Taver". They didn't give much info other than that Traver is the SAC for the Chicago Field Division and that his confirmation would probably be opposed. As we mentioned back on Aug. 4, if approved, Traver would be the first-ever Senate-confirmed ATF director. The position had been filled (at the Treasury Department and more recently at Justice) without Senate input. Since the job became Senate-confirmable in 2006, it seems, no one has made it past the watchful eyes of the gun lobby. Hard to imagine Traver will be approved by the new Senate. The only mention of Traver's nomination in the Chicago area was on the WLS-TV, the ABC affiliate. Even then all they did was reprint the relevant parts of the press release from the White House announcing the nomination. No other newspaper or TV/radio station has any mention of Traver on their websites and that includes both the Chicago Tribune and Chicago Sun-Times. So what about the major broadcast and cable networks? Nothing. No ABC, NBC, or CBS. No CNN, Fox, or MSNBC. One must wonder why Andrew Traver is being treated as such a stealth candidate in the media. Is it because his appointment only matters to the gun culture and the anti-gun rights forces and for the rest of the world it is considered ho-hum news? Or is it because the intent is to sneak Traver through the confirmation process? Sebastian at Snow Flakes in Hell is of the opinion that Obama is just waiting until Congress goes into recess to make this a recess appointment which wouldn't require the advice and consent of the Senate. Traver would hold the office until the end of the next Congress or until the 112th Congress ends in 2012. We'll just have to wait a few more days and see. UPDATE: David Codrea agrees with Sebastian on the possibility of a recess appointment for Traver. He goes over the details in his National Gun Rights Examiner column. UPDATE II: Welcome Instapundit readers and thanks to Glenn for the Instalanche! Here are links to my earlier posts on Andrew Traver. Feel free to post any or all of these blog entries on your favorite forum. Since the Big Media isn't going to publicize the nomination, it will take an Army of Davids to do it instead. All I ask is that you include a link back to the original. November Gun Contests Just In Time For Christmas! "Your Freedom is at Stake"